14-18 years age group at secondary stage, who passes class VIII and subsequently drops out for various socio-economic reasons. The proposed scheme is further intended to retain such girl child up to class XII. In the year 2004-05, the drop out rates of girls from classes I-VIII was about 50.8%. For classes I-X the drop out rate of girls was about 64 % in the same year. Hence, only 36% of the country’s girl students could be retained up to class-X. This is the combined result of several socio economic factors, but a major contributor is no doubt the inability of the parents to afford the cost of education of girl child. Objective: To establish an enabling environment to reduce the drop outs and to promote the enrolment of girl child belonging to SC/ST communities in secondary schools and ensure their retention up to the 18 years of age. 1. The Scheme will cover (i) all SC/ST girls who pass class VIII and (ii) girls, who pass class VIII examination from Kasturba Gandhi Balika Vidhalayas (irrespective of whether they belong to Scheduled Castes or Tribes) and enroll for class IX in State/UT Government, Government-aided or local body schools in the academic year 2008-09 onwards. Married girls will be excluded from the scheme. Girl children studying in private unaided schools are proposed to be excluded since a majority of such schools charge high fees and therefore, parents of such girl students may not require the financial assistance that is being offered under this scheme. Students enrolled in schools run by Central Government are also being excluded from the scheme, as these children are either fully provided for already, or are those of Central Government employees, who can afford education of their children, without further support. 2. The girl child receiving incentive may be entitled to draw the amount on attainment of 18 years of age. The amount of incentive may be transferred to the Central Government’s account in the unfortunate event of the death of the student before attaining the age of 18 years. 2010-11 and 2011-12 respectively. Total financial implication of the scheme in the remaining four years of 11th Five Year Plan will be Rs.1556.73 crore, which is Rs. 56.73 crore more to Rs. 1500.00 crore allotted for the scheme in 11th Five Year Plan. 4. 1% of the total incentive amount each year will be spent on administration, monitoring and evaluation. 5. There would be no restriction based on income criteria for grant of incentive to girls, because SC/ST girls and girls passing out from KGBVs and studying in Government, Government-aided and local body schools would generally be from disadvantaged section of the society. Implementation Partners: State/ UT Governments, Schools controlled and managed by State Governments, Local Bodies and Aided Private Schools and Panchayati Raj Institutions will be the implementing partners. The amount of incentive may be released to the State/ UT Governments for depositing, the same in favour of the eligible girls. Financial Parameters: A sum of Rs. 3000 (Rupees three thousand only) would be deposited under term deposit/ fixed deposit in a public sector bank or in a post office in the name of every eligible girl child. The term/ period of the deposit may be counted from the date of deposit to the date on which the girl child attains the age of 18 years. No premature withdrawal will be allowed. 1. Every implementing school may prepare a proposal for release of amount of incentive after proper examining the eligibility criteria and submit it to the State Governments/ UTs through proper channel. 3. Number of Girl students of SC/ST communities and non- SC/ST girls who pass class VIII examination from KGBVs, who are entitled for the benefit of scheme. 4. Age wise break up of the number of Girl Child entitled for the benefit of scheme. 5. Total amount proposed to be released as incentive. 3. The funds may be released to the State/ UT Governments in two installments in every year. The 1st installment will be released immediately on receipt of the proposal. The 2nd installment may be released only after the receipt of utilization certificate of 1st installment and progress report from the respective State/ UT Government. 4. The application will be verified particularly with reference to birth certificate issued by the School Head based on enrollment record. 5. An account will be opened in the name of the beneficiary in the nearest public sector bank or in a post office by the implementing agency (State/ UT Governments or the autonomous organizations, as the case may be) and the amount deposited in a Fixed Term Deposit. 6. 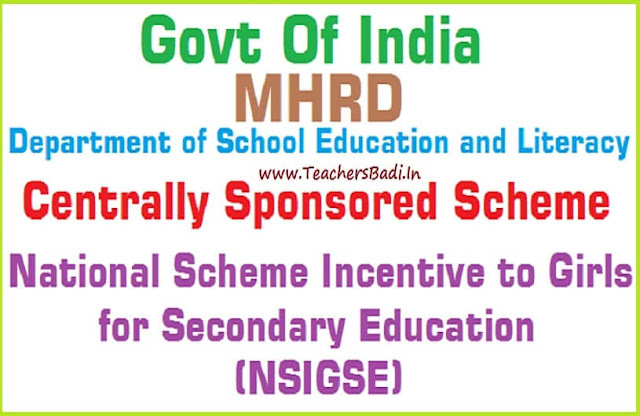 A passbook or a certificate would be given to the student, which will also identify her as a beneficiary of the scheme. 7. The beneficiary will have to continue her study at least for two years in the secondary school after her enrollment in Class IX in order to avail the benefit under the scheme. The Principal/ Head of the school will furnish a certificate to this effect. 8. To be eligible to draw the matured amount a pre-condition would be for the beneficiary to pass class X Board examination successfully. 9. On attaining 18 years of age and production of (i) 10th class pass certificate and (ii) a certificate from the Principal / Head of the school that the girl beneficiary has continued her study for at least two years after enrolment in Class IX the implementing agency will authorize the bank to transfer the matured amount in the interest bearing account to the savings account in the name of the girl beneficiary. Every implementing school may complete the exercise of identification of eligible girl child and preparation of proposal within one month of the commencement of the academic year. The State/ UT Governments will prepare the consolidated proposal and send to the Department of school Education & Literacy, Ministry of HRD, New Delhi within three months of the commencement of the academic year. Grant –in Aid Committee: A Grant–in-Aid Committee headed by the Secretary, School Education and Literacy will be constituted to consider the proposals received from various States/ UT Governments. This Committee may include, Joint Secretary (Secondary Education), JS and FA, Ministry of Human Resource Development, representative of Planning Commission, Ministry of Finance, Ministry of Women and Child Development, Ministry of Social Justice and Empowerment and Ministry of Tribal Welfare. 1. On approval of the proposal by the Grant –in Aid Committee, funds may be released in two installments. First instalment may be released immediately after the approval and next instalment may be released after receipt of Utilisation Certificate and Progress Report from the States/UT Governments. 2. The first instalment may be released on the basis of estimated enrolment figures and the second instalment will be released on the basis of actual number of girl children identified as assisted. The grants to States/ UT Governments may be remitted through Inter Government Adjustment Advice or through the banking channel. This would include direct transfer of grants to the accounts of beneficiaries through the banking channel. 1. The Grant–in-Aid Committee may also function as a Monitoring Committee for the scheme. In addition, the States/ UT Governments may be required to submit Progress Reports every quarter. 2. By the end of the academic year, third party “process evaluation” should be undertaken on sample basis. Wide Publicity: Wide publicity would be planned to familiarize the scheme among intended beneficiaries. Review of the Scheme: The scheme will be rigorously evaluated after two years through appropriate independent agencies in order to further improve the same in future.